Globe and Smart out 1GB data promos. Here are the points you need to consider before subscribing. Smart and Globe out 1GB data allocation for their respective "hero" promo. The latter adds bigger data consumption to the existing GOSURF50 promo, while the former intros a new GIGASURF product. Both became official last July 2. Smart offers the GigaSurf 50 which covers 1GB of "open access" data allocation. This means that you can use this in any data-consuming activity. 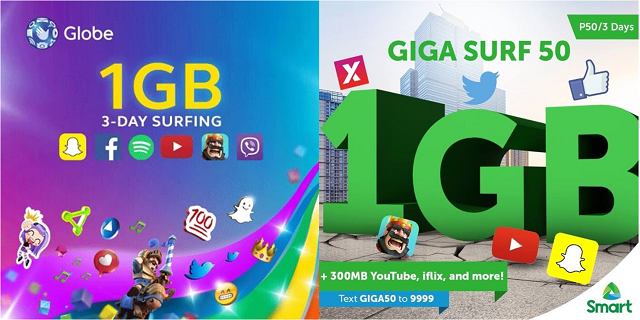 Plus, Smart also gives you 300MB additional data for iFlix, Spinnr, YouTube, Vimeo, DailyMotion, Dubsmash and Skype Qik. As previously mentioned, Globe enhances its existing 3-day GoSurf50 variant by adding 300MB to the existing 700MB allocation of the said product. However, there's a catch. The additional 300MB will only be allocated to one of the following apps: Viber, Snapchat, Spotify, YouTube, Dailymotion, Clash of Clans and Clash Royale. Both promos are valid for 3 days. Smart’s GIGASURF is basically an improvement from BIGBYTES 50 which ended last June 30. To avail this new promo, all you have to do is text GIGA50 to 9999. On the other hand, subscribe to Globe’s new promo with b1Gger data by texting GOSURF50 to 8888. Smart offers the bigger data allocation between the two – it has 1GB of open access data which can be consumed in any sites you wanted to visit, and the additional 300MB data is entitled for its partner apps. Globe splits the 1GB data into 700MB open access allocation and 300MB for partner apps. However, Globe bundles it with unlimited texts to all network and free Facebook. If you’re looking for the convenience of having bigger data, Smart GIGASURF is the better deal. However, Globe’s beefed-up GOSURF50 offers you unlimited texts to all networks which is also a welcome feature for most of us.